The iPhone "virtual" keyboard is still driving me bonkers, but I think I may be winning. You have to pay the telecoms service to send text message that may have been free if sent directly from a mobile phone. The phone doesn't have a history of the messages sent. 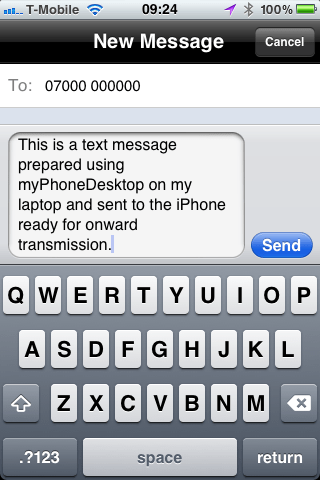 The message arrives at the recipient bearing a sender's phone number other than your own mobile number. There may or may not be ways around this, but they all seemed too clunkey to bother with. The messages may not get delivered! One telecoms provider I spoke to confirmed that some networks won't deliver their messages. Hmm. The iPhone “virtual” keyboard is still driving me bonkers, but I think I may be winning. One of the many, many things in modern life that puzzles me is “how have iPhones and Blackberries become so popular when their keyboards are so utterly dreadful and difficult to use?” I am neither ham-fisted nor sausage-fingered, but accurately typing on these devices almost defeats me (see last week’s blog). I’m not concerned with Blackberries here, but, since I’m coming round to liking the iPhone in most other respects (leaving aside privacy issues, of course), I decided I had to find a better way. My main problem is writing text messages.The keyboard is so small, and the precision of the touch so bad, that there seems to be about a 1 in 4 chance that I’m going to get the character next to the one I actually want. I’ve turned off the auto-correct because that just makes the situation ten times worse. With auto-correct turned on, my text messages look as if they were written by Stanley Unwin (if you don’t remember Stanley Unwin, try this clip as an introduction). Using a capacitive stylus helps, but it’s like using a barge pole compared with the precision of a resistive stylus on a decent phone. Also, the stylus goes walkabout because you can’t push it back into the iphone like you can with a decent phone. The phone doesn’t have a history of the messages sent. 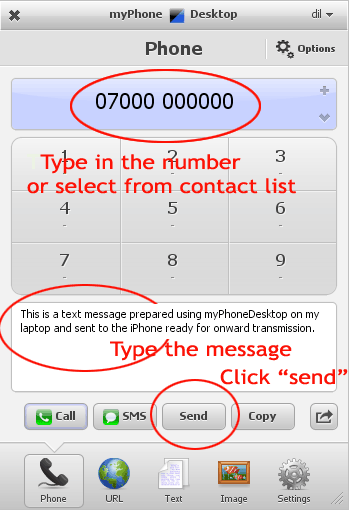 The message arrives at the recipient bearing a sender’s phone number other than your own mobile number. There may or may not be ways around this, but they all seemed too clunkey to bother with. The messages may not get delivered! One telecoms provider I spoke to confirmed that some networks won’t deliver their messages. Hmm. So, back to googling and I found a program called myPhoneDesktop. It consists of free software installed on the PC (or Mac or Linux computer) and an iPhone app that costs £2.99. This is the preparation of the message, as carried out on the PC or Mac. This is the app on the iPhone that has received the message. Just press “send” to send the message as if it had been created on the iphone. It will then appear in the normal messages app. Until today, I’d only used it “for real” for sending text messages, but I’ve just tried it for sending long and complicated URLs (ie website addresses) from my PC to the phone. That works as easily as sending text messages. It can also be used for sending large chunks of text, pictures, and so on. You may have spotted the one big problem with all of this – you have to have a “proper” computer available. True. Urgent text messages may still need to be sent “on the hoof” using the iphone, but if, like me, you have correspondents who prefer texting to emailing and who can wait until you are in front of a proper computer, then it seems to me that myPhoneDesktop makes life a lot easier. Oh yes, there’s another limitation – as far as I can tell this software only works with the Apple iPhone app. There’s no equivalent myPhoneDesktop app for Android, Windows Mobile or Windows 8 Phone. I dare say, though, that there are equivalent solutions for these mobile systems made by other developers.